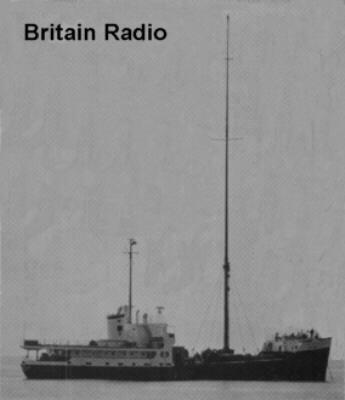 Britain Radio was unique in offshore broadcasting as it shared the same vessel as another station, "Swinging Radio England". Radio England was the high-powered pop station with an American style of presentation and mostly American DJs, while Britain Radio catered for the Sinatra/Fitzgerald/Mancini/Conniff followers, in other words, easy listening. Test transmissions on 355 metres, 845 kHz commenced on 3/5/66 from the MV Laissez-Faire anchored three and a half miles off Frinton, Essex, England, with regular programmes starting on 18/6/66. Unlike its sister station, Radio England, British DJs were well represented in the programming and with the superb PAMS "Hallmark of Quality" custom-made jingle package, the station had an excellent sound. Unfortunately, like Radio England, Britain Radio did not capture the audience or the advertisers to keep it viable, and had some stiff competition in the form of the already established easy listening station Radio 390 broadcasting from Red Sands Tower in the Thames Estuary. Ironically, when the station went bust, a deal was struck with the former managing director of Radio 390 to take over the management of Britain Radio and the name was changed to Radio 355. The music policy was altered to a more lively style to attract a wider audience, and it was beginning to work with a very popular following, but with the British Government's Marine Etc. Broadcasting Offences Act imminent, the station closed down finally on 6/8/67.